Wondering how would your partner want to celebrate Valentine’s Day? 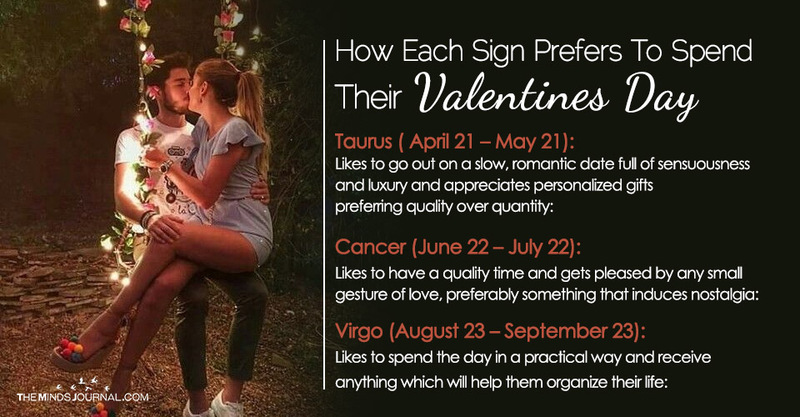 The fiery, passionate Aries would want their Valentine’s day to be an adventurous one, like exploring a new city, have campfires in a forest and similar things which will ignite their thirst for adventure. For gifts, tickets to any sporting event or any event which includes thrill like motor-cycle racing, rock climbing, etc are perfect for your least materialistic Aries. You can also give them something which will help them do their chores easily. The extremely passionate Aries would also appreciate something which will increase the intensity of their passion on the bed. What else do you expect from the bull who is ruled by Venus on Valentine’s Day? Of course, a sensuous romantic date which will include all the luxuries and comfort that one can afford! The romantic Taurus would want to take things slowly, preferring candlelight dinners with soft, romantic music. The homesick bull would also love to spend the night with their partner cherishing homemade food. When it comes to gifts, anything with a personal touch, like handmade photo frames or paper lamps or booking lessons of a class they have been willing to do for long, tickets to their favourite theatre will suffice. Just remember that they prefer quality over quantity. The 4 Most Powerful Zodiac Signs and their Secret Strengths. Gemini wants to communicate and if your Gemini is head over heels in love with you, they would want to spend their Valentine’s Day in a very traditional way, a wonderful dinner with champagne and filled with intellectual conversations. Make sure the conversations are fun-filled too because Gemini tends to get bored quite easily. Spending the night, teasing and seducing their partner and indulging in the exploration of bodies and physical conversations is something the flirtatious Gemini would love. For gifts, give them gadgets which will help them stay connected to people and they wouldn’t want anything else. E-book reader works well too to stimulate their intellect. The Kind of Man You Fall For, This is What Your Zodiac Reveals. The sensitive, romantic Cancer gets overwhelmed by little gestures of love and enjoy spending quality time with their partner. Homemade food, cards, anything will make them happy. They love to indulge in nostalgia and something which will bring back the memory of their honeymoon days with you will be the perfect gift for them.